- The bolt that you need to remove is an E20 female Torx socket. I think this might vary from year to year. It's a stiff bolt, so you probably don't want try and use something "close enough". 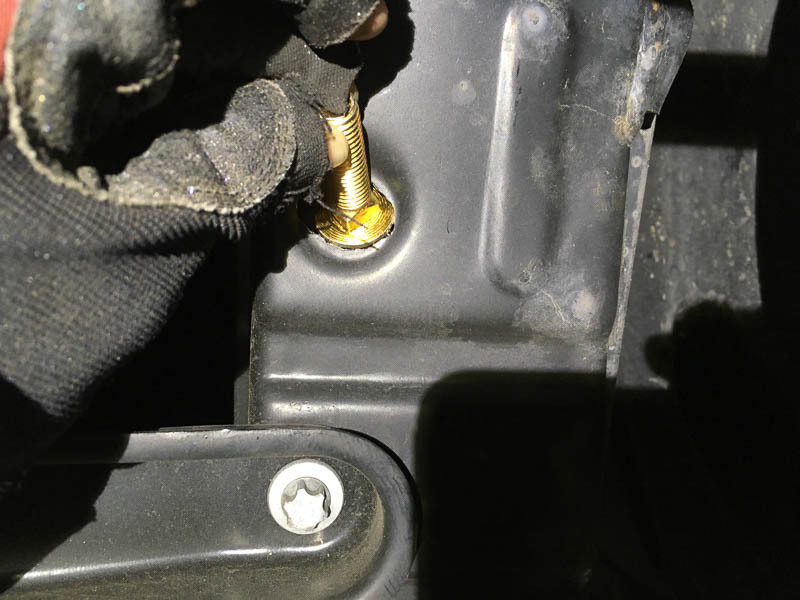 - Have a maybe foot-long, thin socket extension (3/8") to make torquing the Torx bolt easier...Otherwise you're likely to be going back and forth one click at a time with your socket. - A good punch will be handy for preventing the drill bit from squirreling around. I had to use two bits to get through (smaller one first, larger one after). - Make sure you have a tungsten carbide cutting bit. I used a standard bit with my Dremel and it did nothing. The carbide bit made it a 10-minute cut. - The hole you embiggen needs to fit both the lug and the bolt that will pass through it, so have them both handy while you're cutting to check if the hole is big enough. - Safety glasses and a comfortable position will be your friend as hot steel chips rain down upon thee from on high for minutes of drilling and cutting. Also headlamps are dope. - I couldn't quite torque the front-most bolts to 70 ft-lb. I got them damn tight, but not quite there. The front lug kept spinning freely inside the frame, whereas the other lug hits the side of the frame, which prevents it from spinning. - I had the car on stands by the factory jack points in front of the rear wheels. 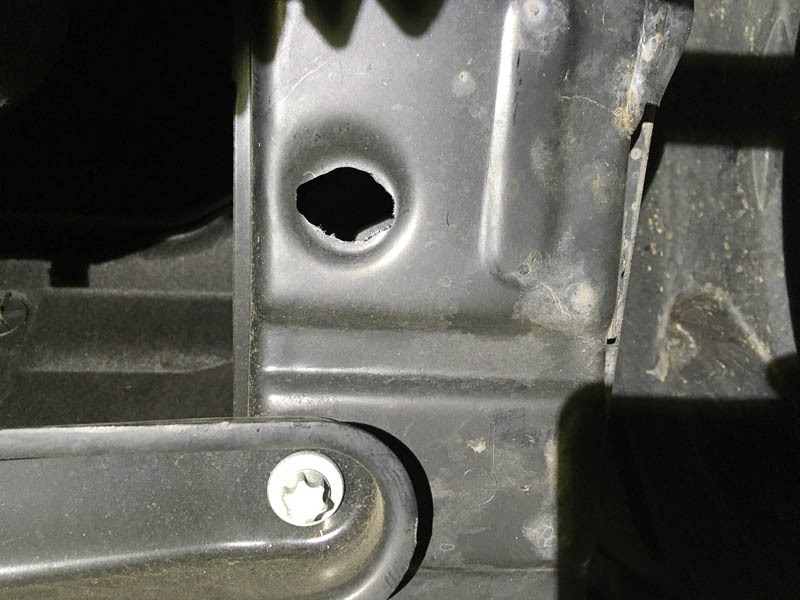 When I started removing the stock bolts, I noticed the whole subframe was coming down with the bolt...I wasn't sure if that was okay or not, but I didn't like it. I wound up supporting the car by the rear suspension (the big hollow swingarms) and that prevented the decoupling. - The hitch is rated for 200 lb tongue weight and 2000 pound tow capacity, but the Smart is rated for zero in the US. Tow light, tow slow. jwight and centralohcpl like this. Last edited by Tremelune; 10-24-2018 at 11:26 PM. This is awesome! I've been wanting a two-bike rack so badly. 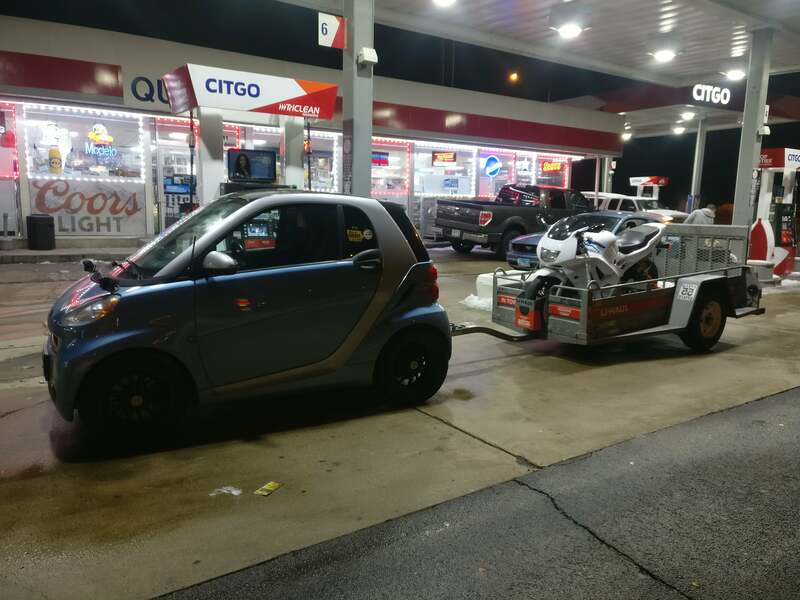 I didn't think we could get a hitch on the Smart ED. Where did you get the hitch from? Even better, use something that'll last longer like POR-15 or similar rust protectants on both the subframe and the hitch. The subframe doesn't have as beefy rust protection as the tridion cell and it definitely shows in salty states. The hitch is even worse as I don't think it has any real rust protection at all. Can't speak for the EDs, but the petrols have more than enough grunt and brakes to move some weight around. However, I generally keep it at no more than 1,400 lb (800lb rental trailer plus my 600lb Goldwing). This CBR600F3 was pretty easy to tow. Streamlined and lightweight bike for the win!